Grinnell Glacier | Get Inspired Everyday! Grinnell Glacier | Get Inspired Everyday! 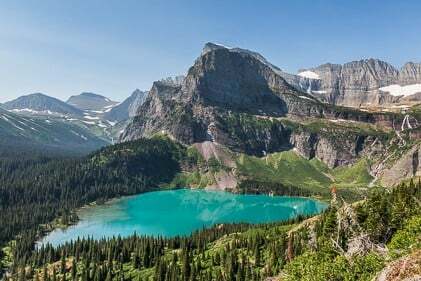 Location: Glacier National Park – Montana, U.S.A. 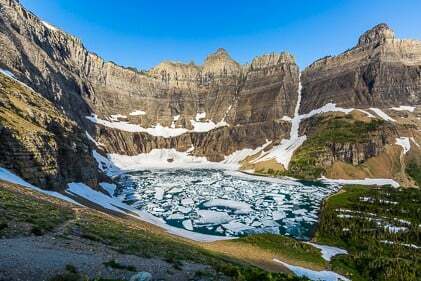 The route to hike into Grinnell Glacier is located in the Many Glacier region of Glacier National Park. The trail meanders along Lake Josephine for a while, and then quickly climbs out of the forest. You can also shorten this hike by taking the boat ride on Lake Josephine which cuts off a few miles. 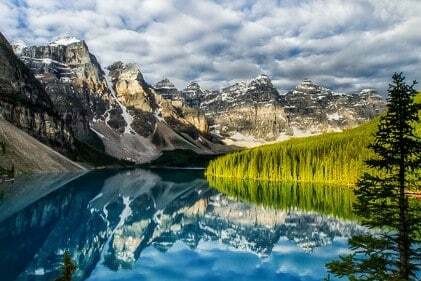 The scenery on this hike is particularly stunning, with increasingly amazing views of Grinnell Lake, (above photo). 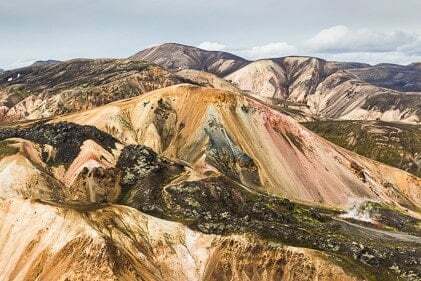 The color deepens as you gain elevation until it looks almost unreal. Early in the season, you’ll find waterfalls and snow across the trail. On the way back down, Tyler went through the waterfall. It looked so refreshing that I packed the camera equipment away so I could run through it too. It was so cold, you couldn’t stand in it for more than 30 seconds without giving yourself a temporary ‘ice cream headache’. The temperature got up to around 90°F that day, so the glacier cold water felt great! When you push through the final climb to the glacier, you’ll be rewarded with the most beautiful glacial meltwater pool filling most of where the glacier has receded. 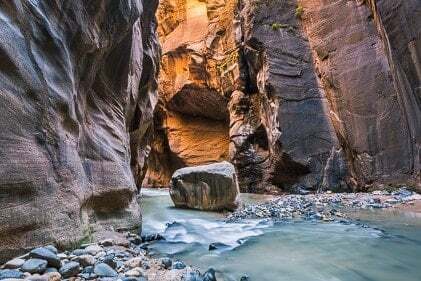 The glaciers in the park have lost most of their size over the last hundred years, and scientists estimate that they could be completely gone by the year 2030. Even though they’re smaller now then they were before, they’re still really stunning. We loved this hike so much, we want to hike into more of the glaciers around the park before they’re gone. You never know, we may only have a small amount of time to see some of the smaller ones. The color of the melt water surrounding the glacier was a deep aqua, reflecting the mountains above. It was really ideal to do this hike in the end of July. There was still snow dotting the peaks and wildflowers filled the fields below. The glacier is also in peak condition early in the season. Later in the season, there is more melt water which is beautiful as well, just not as much glacier to see. 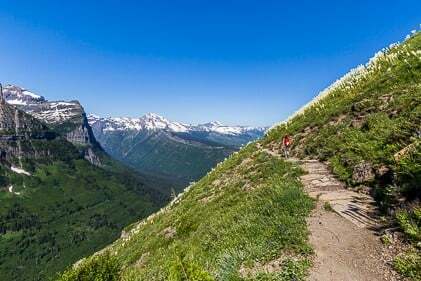 If you ever get the chance to come to Glacier National Park, this hike is definitely worth putting on your to-do list. The views are just so incredible all season long, right into the fall! *Note – Be sure to bring your bear spray on this hike. The trail is heavily used by bears. It’s best to hike with 4 or more people in your group if you can. Our 5 yr old hiked this trail all the way up this month and he did extremely well. He’s also an amazing seasoned hiker so you need to know your kid’s ability and how well they do on a hike with such elevation gain. I ended up carrying him down the mountain for about 2 miles or so, past the rocky terrain because he did get tired after the long trek uphill. But I was very much prepared for it, with a carrier appropriate for his size and age. Hope that helps. Wow, that’s truly incredible, and thanks so much for sharing Anka! Would this hike be ok for children? 4-15? I think it would probably be too much for a 4 year old since it’s almost 12 miles with right around 2,000′ elevation gain. I’ll email you the link to the post I did about my top 3 short hikes in Glacier which would probably work better, but obviously it depends on your individual circumstances and hiking set up. We hiked through the waterfall on August 13th. Was refreshing. My wife had a bit of emotional struggle through it but was OK. She was not comfortable with the idea of potentially slipping but those Vibrams are made for for exactly this situation. JILLION people on trail and at Glacier a bunch of 19 year olds joined the Polar Bear Club and jumped in the glacier melt pond. Overall this is one of most beautiful hikes I have ever been on. I’ve hiked all over California’s Sierra, Hawaii, Swiss Alps, Solvenia Alps, Dolomites and others and this is a top 10 world hike. Stunning! Be prepared. As a former Eagle Scout, i am shocked but people that hike unprepared, no water, tennis shoes, and have no food or basic first aid equipment. If you are prepared and self-aware than wilderness experiences are hard to beat and bring life-time memories. While most people don’t realize it, this is a dangerous hike. The waterfall that you must go thru is not a trail but a series of slippery rocks. I believe they should put a small awning over the trail at that point to deflect the water over the trail. I went on that hike on Aug 6, 2013. Our group was with a ranger and we stopped at the picnic area across the valley from the infamous waterfall. We had a direct, though somewhat distant view of those falls. Suddenly we heard a whistle blow. Our ranger took off as she had a radio. A male had slipped off the rocks (someone said he was posing for photos but I’m not sure of that). He fell about 15-20 feet. A PA (I heard) who was just ahead of him came back, went down and tried to help. I heard (though I don’t know for sure) he lost consciousness for a while. We went thru the falls and went to the glacier. On the way back several hours later we saw the helicopter that lifted him out. Later on I saw the ranger and she wasn’t sure how he was doing. This is a spectacular hike. The scenery is amazing. That very small waterfall area should be modified. Probably should’ve put that in the post!